Google Cloud Messaging for Android. This tutorial explains about that how to receive push notifications in android using GCM (Client side). 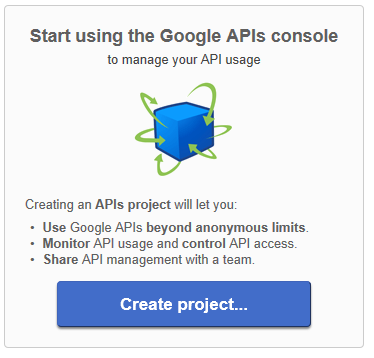 First, we have to create an Google API project. 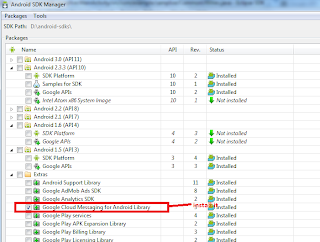 Install required libraries in android sdk. 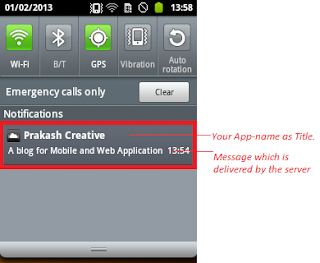 Create client application in android. 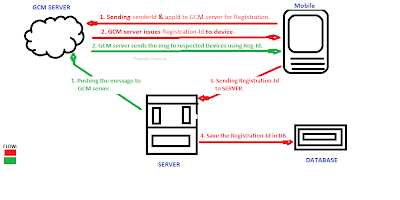 Create one server side application to send messages to GCM server. 1. How to create an Google API project? Follow the steps for creating new Google API project. 1. 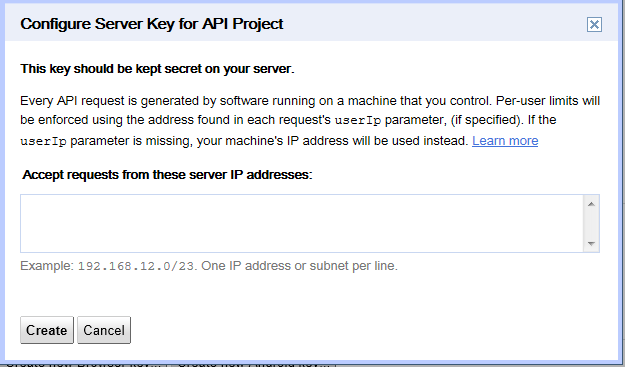 Open the Google API console page (Google account required). The page open like this. Take down the Sender-ID from your browser URL. 3. Enable the toggle Google Cloud Messaging for Android in services and accept the terms in the Terms of service page. 4. Generate new server API key. a. In main page, select API Access. 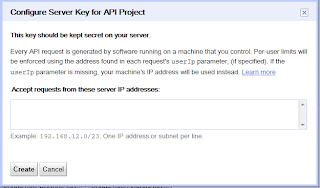 Take down server API key (your serverApi key here). It will used in server side to send notification. New server key activate within 24 hours. 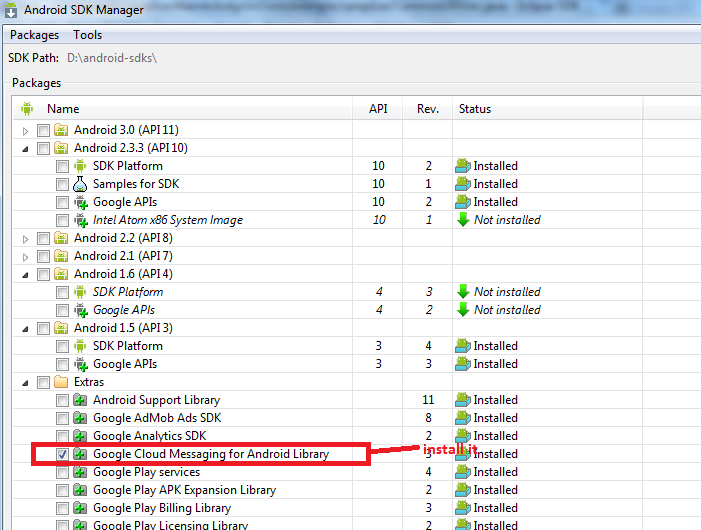 Go to SDK Manager, Extras > Google Cloud Messaging for Android Library and install it. If installation successful then you can find gcm directory under Your_SDK_Installed_Path/extras/google/ containing these sub-directories: gcm-client, gcm-server, samples/gcm-demo-client, samples/gcm-demo-server, and samples/gcm-demo-appengine. If you don't see Extras > Google Cloud Messaging for Android Library in the SDK Manager, make sure you are running version 20 or higher. Be sure to restart the SDK Manager after updating it. A. Copy the gcm.jar file to res->libs folder in your android project. You can find this file in Your_SDK_root\extras\google\gcm\gcm-client\dist. B. Required permissions and changes in your android manifest file is follows. C. Paste the below strings in res->values->strings.xml. If not there then create new one. D. Create new class called CommonUtilities.java and add the below code. 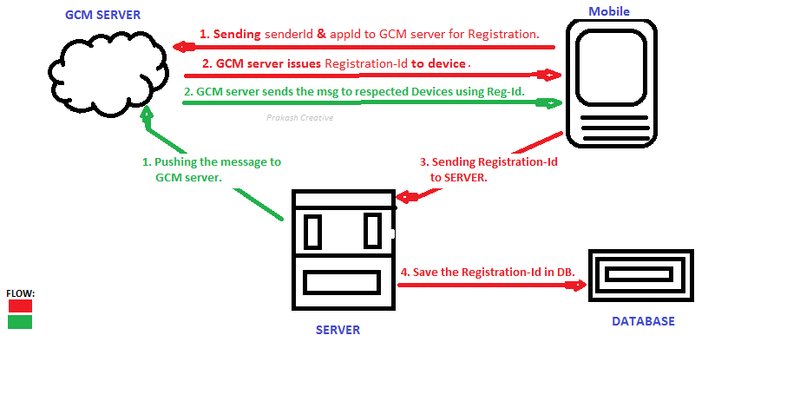 * Google API project id is your SENDER_ID and it is use to register with GCM. * Tag used on log messages. * Intent used to display a message in the screen. * Intent's extra that contains the message to be displayed. * Notifies UI to display a message. * UI and the background service. * message to be displayed. E.Create a new class called GCMIntentService. The following methods which are called by GCMBroadcastReceiver. send messages to this device. server so it unregisters the device. has a payload, its contents are available as extras in the intent. nothing to be done other than evaluating the error (returned by errorId) and trying to fix the problem. library will retry the operation using exponential backup, unless this method is overridden and returns false. // ServerUtilities when the registration to the server failed. F. Create new class called ServerUtilities.java. This is used to register your app details in server. Follow the below code for ServerUtilities class. I have used .net web-service to save the regId in server. * Register this account/device pair within the server. * @return whether the registration succeeded or not. * Unregister this account/device pair within the server. // registered in the server. // a "NotRegistered" error message and should unregister the device. // Automatically registers application on startup. 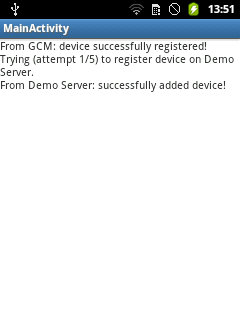 // Device is already registered on GCM, check server. // GCMIntentService.onUnregistered() will ignore it. * uncomment the equivalent options on options_menu.xml). NOTE: Push Notifications won't work in normal emulators. You must use Google APIs emulator and add your Google account in emulator (go to settings->Accounts & sync->Add account). You will get screen like below on successful registration. Download sample code from below links.